High flow rates, precise and economically priced, ThinWall Precision Tips reduce back pressure, improve performance and extend lifespan of equipment. 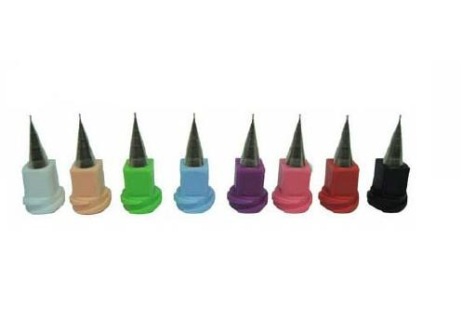 The One Piece Precision Tip features Luer Lok™ plastic hubs for easy threading and higher flow rates and lower back-pressures than traditional dispensing tips, producing less stressed equipment with a longer life. We now offer a sample kit for these thin wall tips that includes one of each gauge size from 18 to 30 gauge. Click "View Product" below and add the SKU# 3221100 to the shopping cart! ThinWall tips resist clogging and stringing, and with color coded standard Luer Lock hubs (in plastic or in a reusable metal hub) will allow operators or robotic users to employ smaller gauges without sacrificing flow rate. Smaller gauge, ultra-thin wall, enhances accuracy and finer definition of dots, lines, or patterns, while reducing stringing or tailing. The finely drawn ThinWall design means that in large ID fluid paths, the thickness line is achieved without sacrificing specified fluid dispense rates. Part # Plastic Hubs – 8 per box I.D. O.D. Micro-dots and lines down to 50 μm(.002 in. ), high flow rates with precise apertures. Economical, with reduced back pressure, resists clogging and stringing, while improving break-off. Color coded hubs offer the same ease of use as standard ThinWall designs, with smaller gauges, without sacrificing flow rate. You'll still have minimal run-out, reduced variability and increased accuracy. 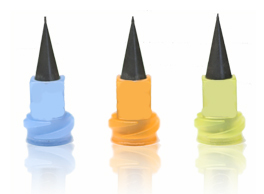 Please remember to take appropriate care with the Micro ThinWall Tips, because the finely drawn walls and extremely small opening of the dispense tips will leave them more prone to being dented or crimped. Always keep them in the specially constructed jewel boxes with which they are packaged to arrive safely and to kept securely until use. The IDS Service Team will be there to help if you need replacements, but you should consider keeping some back stock just in case of emergency. Part # Plastic Hubs – 8 per box I.D. 3221134 31 ga Blue Micro Thin Wall Precision Tips - 0.006"
3221135 32 ga Orange Micro Thin Wall Precision Tips - 0.004"
3221136 33 ga Yellow Micro Thin Wall Precision Tips - 0.002"
Compatible with all ThinWall dispensing cores. Replace only the wetted core, not the hub. Reduces time consuming cleaning processes. QUOTE ONLY - We suggest trying out the plastic hub version above, and then moving to the reusable hub with disposable inserts when you go into mass production. Cores are used in conjunction with Reusable Hubs (shown above) and are an economical choice for many applications, since only the wetted path is replaced. They are also ideal for heated applications and reduce maintenance down time, clogging and stringing and improves fluid break-off. They are also a Greener alternative for any company that is conscious of their waste by weight for disposal. Length tolerances of 0.10" help locate tips quickly in automation. *Phosphor bronze cores are plated with Electroless Nickel, Class II. *18 - 25 also available in PTFE coating. Threaded into a Luer Lock fitting, length after is aproximately 0.5"